Quickly integrate all major payment methods using one of our free plugins, or build your own payment product with our robust yet simple API. One contract. Access all major payment methods with a single contract. One integration. A single integration to accept all major payment methods. Multiple acquirers. Added reliability through multiple acquiring banks. Always secure. From PCI-DSS to PSD2, all your safety needs are taken care of. With Mollie you can build your business wherever you want. Whether you want to grow internationally or focus on a specific market, Mollie supports all major payment methods. Accept payments from customers from anywhere in the world. The online wallet with 184 million active users worldwide. Klarna provides the most flexible way to pay in slices. The payment method preferred by 20 million shoppers in 8 countries. One of the most used online payment method in Germany. Payment method for the 2.5 million Belgian customers of the ING. The prepaid payment method available in 43 countries. The most popular payment method in Poland. Mollie helps you to run your business as efficiently as possible, with features that make your payments straightforward, effective and easy to navigate. Mollie Dashboard enables you to easily find any order number, amount paid, or customer name. Search by adding ready-made filters and immediately gain insight into your payments. Quickly integrate all major payment methods: simply drop them into your hosted webshop with one of our free plugins and enjoy a swift payment experience. Want to add a new payment method down the line? You can simply activate them in your Dashboard with one click. Together with our developer community, we built packages and plugins, so you can build on our expertise and integrate Payments quickly into your project. Our packages are completely open-source and freely available to everyone. Love to code? 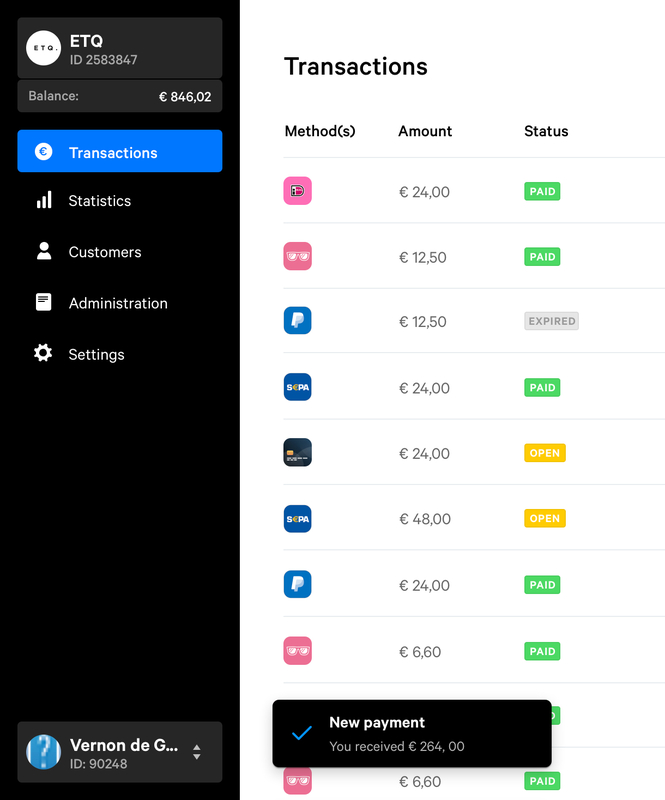 Next to our ready-made and free plugins you can use our expansive yet simple API; decide how you integrate Payments and build advanced and reliable products yourself from scratch. Checkout turns a simple, standard payment form into a professional, on-brand experience that inspires trust and drives conversions. All without having to write a single line of code. Mollie allows you to quickly and easily accept payments through credit cards, the most widely used online payment method in the world. It only takes 10 minutes to start receiving payments through credit card and there are no hidden fees involved. You only pay for successful transactions. Mollie supports all the world’s leading credit card brands. Currently we support Visa, Mastercard, American Express, Cartes Bancaires and CartaSi, giving you the ability to service customers globally and locally. Visa alone has 2.5 billion cards in circulation and is active in more than 200 countries, with a total of 109 billion transactions per year. It’s very easy for customers to pay with their credit card. All that’s required of the customer is that they fill in their card details and authorise the payment. As a merchant, you can use our Recurring API to create even easier one-click payments or generate recurring payments like subscriptions, top-ups or payments in instalments. Accepting credit cards in your online store requires several difficult compliance and security procedures. Every server that stores sensitive information needs to be PCI compliant. Mollie ensures that no sensitive information hits your servers, so you’re automatically and fully PCI-DSS compliant. Through our clever onboarding process, you can start accepting payments quickly, without any of the paperwork that’s involved when setting up a connection yourself. Our clever yet simple API makes the integration incredibly robust and built for volume. Our API and Dashboard allow for direct refunds and can export all your data to several different formats for your bookkeeper. Our pricing is very competitive, with no hidden fees at all. Furthermore, we have free, open-source packages and plugins available for most coding languages and e-commerce platforms, which allows for easy integration into any project. Our prices are transparent and are always per successful transaction only. And your personal dashboard gives you crucial insights into all your transactions and statistics. Mollie is the quickest and easiest way to implement credit cards as a payment method. Mollie allows you to quickly and easily receive payments through PayPal. It only takes 10 minutes to start accepting payments through PayPal and there are no hidden fees involved, you only pay per successful transaction. To receive payments through PayPal, a PayPal business account is required. This account can be easily connected to a Mollie account. When customers choose the PayPal payment method, they’re forwarded to the PayPal payment page, where they log in to their PayPal account. Here, they choose one of the payment options linked to their PayPal account and authorise the payment. Merchants receive instant feedback from Mollie when the status of the payment is known. The amount will be added directly to your PayPal account. From there, you can transfer it to your bank account or pay using PayPal. Implementing PayPal through Mollie allows you to offer all major payment methods through a single integration, with all your insights and the connection to your back office available to you through a single API. Our clever yet simple API makes the integration incredibly robust and built for volume. Our API and Dashboard allow for direct refunds and can export all your data to several different formats for your bookkeeper. Implementing PayPal through Mollie is easy, there’s no lengthy signup process and we have free, open-source packages and plugins available for most coding languages and e-commerce platforms, which allows for easy integration into any project. Our prices are transparent; you only pay a low fee for successful transactions. And your personal dashboard gives you crucial insights into all your transactions and statistics. Mollie is the quickest and easiest way to implement PayPal. Klarna is a flexible payment solution, which allows your customers various, flexible, ways to pay. With Mollie you can integrate Klarna: Slice it quickly and start processing payments right away. You only pay for successful transactions, no hidden fees involved. What is Klarna: Slice it? With Klarna: Slice it you can offer your customers to pay with consumer financing, without them having to go through a lengthy sign up process. Offering an easy way of consumer financing is especially a great advantage when you have a high average order value, lowering the barrier for customers to make the purchase. By filling out a few simple personal details, customers can cut up the amount due in installments and pay it off in anywhere between 3 to 36 months, with interest or without. No matter which duration your customer chooses, as a merchant you will get paid out immediately once the product is shipped. The credit check, that runs in the background while your customer is paying, will assess whether the customer is eligible for consumer financing and what the available monthly installments are. The actual payments take place at a later moment and are made in the Klarna app or customer portal through another payment method like iDEAL or credit card. For effortless recurring payments, customers can also choose to link a bank account to their Klarna account. As a consumer centric company, Klarna bases variables like costs and the availability of their products on the location of your customer. Slice it is available from customers residing in Austria, Germany, and Finland. For more information on the costs and availability, check out the articles on Klarna in our help center. Klarna covers all fraud and financial risks that arise when offering your customers the option to pay over time. How does Klarna: Slice it work? In the checkout the customer selects ‘Slice it’ as their payment method. The customer fills out only top of mind information to pay. Customers paying for the first time will be asked to provide their full name, billing address, date of birth, phone number, and email address. Returning customers can simply pay by filling out their email address or phone number and date of birth. When a new customer is applying for a Klarna account and ‘Slice it’ payment, Klarna will run an affordability check in the background. After submitting the order, the customer will get an email with a payment link and the order amount will be added to the total balance in their Klarna account. The customer can pay with their preferred payment method through the Klarna consumer portal on klarna.com or in the Klarna app. By implementing Klarna through Mollie you get simplicity and flexibility, for both you and your customer. With Klarna - Slice it you can offer your customers the ultimate payment flexibility and with Mollie you get the easiest way to implement and manage this payment solution. Simply implement Klarna with the Mollie Orders API, or use one of the many plugins, and start receiving Klarna payments today. Mollie allows you to accept payments from 34 countries quickly and easily through SEPA bank transfer. It only takes 10 minutes to start receiving payments through SEPA bank transfer and there are no hidden fees involved, you only pay for successful transactions. What is a SEPA bank transfer? How does a SEPA bank transfer work? When customers choose to pay through SEPA bank transfer, they receive the payment details directly on their screen or through an e-mail. Customers then log in to their own online banking environment and transfer the payment from there, when it’s convenient for them. Instead of filling out the details by hand, we offer QR-codes that fill out all the required bank details to make paying even easier for your customers and eliminate the chance of errors. Should a customer fill out the wrong bank details. We offer automatic refunds. Processing a SEPA bank transfer generally takes a couple of workdays, but we have instant status updates for the payment status, so you can ship your order immediately when it’s confirmed. Using Mollie to receive payments through SEPA bank transfers allows you to offer all major payment methods through a single integration. Mollie has dedicated bank accounts for Belgium, France, Germany, and the Netherlands, which means consumers from these countries transfer funds to a familiar, localised IBAN. We offer instant updates when a payment gets through, so you don’t need to check your bank account. The QR codes that we generate, minimize flaws and allow for quick payments. Our clever yet simple API makes the integration incredibly robust and built for volume. Our API and Dashboard allow for direct refunds and can export all your data to several different formats for your bookkeeper. And our pricing is very competitive, with no hidden fees at all. Implementing SEPA bank transfers through Mollie is easy, there’s no lengthy signup process and we have free, open-source packages and plugins available for most coding languages and e-commerce platforms, which allows for easy integration into any project. Our prices are transparent; you only pay a low fee for successful transactions. And your personal dashboard gives you crucial insights into all your transactions and statistics. Mollie is the quickest and easiest way to implement SEPA bank transfers. Mollie allows you to quickly and easily collect recurring payments through SEPA Direct Debit. It only takes 10 minutes to start receiving payments through SEPA Direct Debit and there are no hidden fees involved. SEPA stands for Single Euro Payments Area. SEPA Direct Debit was introduced by the European Council to streamline the European payments structure. With SEPA, bank transfers can be done from any European checking account to any other European checking account. SEPA Direct Debit makes it possible to collect recurring payments easily. Just set up a mandate and you can collect subscription fees, monthly donations or any variation on this easily. SEPA Direct Debit makes it easy for creditors to collect funds from a payer’s account. It can be used for everything from regular subscription payments and monthly donations, to one-click payments and paying in instalments. All of this is possible throughout 34 European countries, which makes SEPA Direct Debit incredibly powerful for Europe-wide expansion of subscription services. Through SEPA Direct Debit it’s easy to collect recurring funds from your customers. For this to be available the customer needs to provide a signed mandate, which allows the merchant or creditor to collect the funds from their bank account. Once the mandate is provided, payments can be collected without the customer having to do anything. There are many benefits of collecting recurring payments through SEPA Direct Debit through Mollie. Through our clever integration, the customer can sign the mandate through a variety of payment methods. Mandates can be signed through iDEAL, Belfius, credit card, Bancontact, SOFORT Banking and the KBC/CBC Payment Button. Our clever yet simple API makes the integration incredibly robust and built for volume. Our API and Dashboard allow for direct refunds and export all your data in several different formats for your bookkeeper. Our pricing is very competitive, with no hidden fees at all. Using Mollie to collect recurring payments through SEPA Direct Debit is easy, there’s no lengthy signup process and we have free, open-source packages and plugins available for most coding languages and e-commerce platforms, which allows for easy integration into any project. Our prices are transparent; you only pay a low fee for successful transactions. And your personal dashboard gives you crucial insights into all your transactions and statistics. Mollie is the quickest and easiest way to implement SEPA Direct Debit. Mollie allows you to quickly and easily accept payments through SOFORT Banking, a European-wide payment method available in 8 countries. It only takes 10 minutes to start receiving payments through SOFORT Banking and there are no hidden fees involved, you only pay for successful transactions. SOFORT Banking can be used by shoppers from 8 countries in Europe. This makes it the ideal payment method to allow for Europe-wide expansion, which will drive conversions. SOFORT Banking is available in Germany, Austria, The Netherlands, Switzerland, Italy, Spain, Belgium and Poland. It works with most consumer banks from these countries. When customers choose to pay through SOFORT Banking, they are redirected to SOFORT Banking’s online banking environment. Here they choose their country and bank. They log in with their own online banking credentials and are shown their accounts. Customers then choose which account they want to transfer the payment from. Finally, the payment is authorised and customers are returned to the webstore. The merchant then receives an immediate confirmation of the payment. When you use Mollie to accept payments through SOFORT Banking, you don’t just get the comfort of accepting all your payment methods through one provider, which allows you to easily keep track of your accounts and export them all in one go for your bookkeeper. You get access to our clever yet simple API, built for both easy integration and handling high volumes. Our API and Dashboard allow for direct refunds and can export all your data to several different formats for your bookkeeper. Furthermore, our prices are very competitive, with no hidden fees at all. Implementing SOFORT Banking through Mollie is easy, there’s no lengthy signup process and we have free, open-source packages and plugins available for most coding languages and e-commerce platforms, which allows for easy integration into any project. Our prices are transparent; you only pay a low fee for successful transactions. And your personal dashboard gives you crucial insights into all your transactions and statistics. Mollie is the quickest and easiest way to implement SOFORT Banking. Bancontact processes about 150,000 transactions a day, making it the most used payment method in Belgium. With Mollie you only pay a set, low fee for every successful transaction. Bancontact is the Belgian market leader when it comes to electronic payments. It offers a wide variety of payment services in addition to online payments, like in-store card transactions. This makes Bancontact a well-known and trusted name in Belgium. As a result, the number of people paying online with Bancontact as well as the average amount spent per transaction keep growing. The consumer holds a physical card which is linked to a Belgian bank account. There are over 15 million Bancontact cards on the market, issued by 20 different Belgian banks. Bancontact processes about 150,000 online transactions a day. By offering Bancontact as a payment method in your webshop you can take advantage of this big, growing pool of Bancontact users. Payments made through Bancontact are guaranteed and immediately confirmed. This means that the payment is final once it’s been made and can’t be reversed by the consumer. On top of that, payments with Bancontact are always protected by 3D-secure technology. In 2015, Bancontact introduced an app, which makes paying online even easier. Add Bancontact to your payment methods and start growing your business in Belgium today. The Electronic Payment Standard (EPS) is a payment method, developed by various Austrian banks. This makes EPS the main bank transfer payment method in Austria and highly popular with Austrian shoppers. With Mollie you can integrate EPS quickly and start processing payments right away. You only pay for successful transactions, no hidden fees involved. The Austrian e-commerce market is governed by Alternative Payment Methods, with bank transfer as the most commonly used payment method. EPS holds the position of most popular bank transfer payment method in Austria. Customers like to use the payment method, because it’s an initiative of the Austrian banks and Government. When you use Mollie to accept payments through EPS you get access to our clever yet simple API, built for both easy integration and handling high volumes. Our API and Dashboard allow for direct refunds and can export all your data to several different formats for your bookkeeper. Furthermore, our prices are very competitive and transparent. Implementing EPS through Mollie is easy, there’s no lengthy signup process and we have free, open-source packages and plugins available for most coding languages and e-commerce platforms, which allows for easy integration into any project. Our prices are transparent; you only pay per successful transaction. Get crucial insights into all your transactions and statistics through the personal dashboard. Mollie is the quickest and easiest way to implement EPS. Giropay is a popular bank transfer payment method in Germany. It uses more than 1,500 German banks, which makes it a trusted payment method under German customers. With Mollie you can integrate Giropay quickly and start processing payments right away. You only pay for successful transactions, no hidden fees involved. When you use Mollie to accept payments through Giropay you get an access to our clever yet simple API, built for both easy integration and handling high volumes. Our API and Dashboard allow for direct refunds and can export all your data to several different formats for your bookkeeper. Furthermore, our prices are very competitive and transparent. Implementing Giropay through Mollie is easy, there’s no lengthy signup process and we have free, open-source packages and plugins available for most coding languages and e-commerce platforms, which allows for easy integration into any project. Our prices are transparent; you only pay a low fee for successful transactions. And your personal dashboard gives you crucial insights into all your transactions and statistics. Mollie is the quickest and easiest way to implement Giropay. Mollie allows you to quickly and easily accept payments with ING Home'Pay. It only takes 10 minutes to start receiving payments and there are no hidden fees involved, you only pay for successful transactions. ING Belgium is one of Belgium's biggest banks. It created Home'Pay as a dedicated payment method for its consumer and enterprise customers. Home'Pay allows customers with either a Home'Bank or Business'Bank online banking account to safely pay for online purchases through their own, trusted online banking environment, without the need for a credit card. Because payments are transferred directly from the customer's bank account, once authorised, payment is guaranteed. This means that Home'Pay is both safe and reliable for retailer and consumer alike. ING Belgium has over 2.5 million customers who are eligible to use the ING online banking environment and Home'Pay. Furthermore, Belgium could be a great addition to any online market. Over 2016 the Belgian e-commerce market saw a turnover of 9 billion euro and was the fastest growing e-commerce market of Europe. Expectations for the next years mirror these positive numbers. A full stack of dedicated Belgian payment methods lets you tap into this growing market successfully. How does ING Home'Pay work? Paying with Home'Pay is a breeze for consumers. They select the Home'Pay payment method in your store or app. Then they use the ING Card Reader to log on to their Home'Bank or Business'Bank online environment over its secured. When logged in, they select the account with which they'd like to pay. After that, all that's left to do, is check the details and confirm the payment. Once authorised, payment is guaranteed, which allows merchants to continue processing orders immediately. Using Mollie to accept Home'Pay has many benefits. You can accept all major payment methods, including a complete offering of Belgian methods, through a single integration. You can start accepting payments quickly, within 10 minutes even, through our sophisticated onboarding process. Our clever yet simple API makes the integration incredibly robust and built for volume, and allows for easy integration. Dashboard lets you refund directly and can export your data to several different formats for your bookkeeper. And Dashboard gives you crucial insights into all your transactions and statistics. On top of all that, our pricing is very competitive, with no hidden fees, ever. Implementing Home'Pay through Mollie is incredibly easy. There's no lengthy signup procedure and we have free, open-source packages and plugins available for most coding languages, like NodeJS and PHP, and e-commerce platforms, like Magento and WooCommerce. With these packages and plugins, you can use our products for any project you can think of, from simple online stores to sophisticated subscription-based business models. For great businesses of whatever size, Mollie is the quickest, easiest, and most reliable way to accept payments online. Mollie allows you to quickly and easily accept payments through paysafecard, a leading prepaid payment method in 43 countries. It only takes 10 minutes to start receiving payments through paysafecard and there are no hidden fees involved, you only pay for successful transactions. paysafecard is an online prepaid payment method consisting of a prepaid card that allows customers to pay for their shopping without having to give out personal or financial details, or without having a bank account or credit card. paysafecard is the market leader for European prepaid payment methods and the cards can be bought at over 500.000 sales outlets in the amounts of 10, 25, 50 or 100 euro. paysafecard is used mostly by young shoppers and customers without bank accounts. They’re used most often to buy games, movies, books and software online. Other services include social media, online dating platforms, VoIP services and cloud and travel services. When a customer chooses to pay through paysafecard, he or she needs to have a prepaid card ready, or use their online paysafecard account. While checking out they’re prompted to enter the code that they found on the prepaid card underneath a scratch away layer. The amount paid is deducted from the amount on the card. It’s also possible to use several cards to pay for a single purchase. Implementing paysafecard through Mollie allows you to offer all major payment methods through a single integration. Through our clever onboarding process, you can start accepting payments quickly, without any of the paperwork that’s involved when setting up a connection yourself. Our clever yet simple API makes the integration incredibly robust and built for volume. Our API and Dashboard allow for direct refunds and can export all your data to several different formats for your bookkeeper. Our pricing is very competitive and transparent, there’s no hidden fees at all. Implementing paysafecard through Mollie is easy, there’s no lengthy signup process and we have free, open-source packages and plugins available for most coding languages and e-commerce platforms, which allows for easy integration into any project. Our prices are transparent; you only pay a low fee for successful transactions. And your personal dashboard gives you crucial insights into all your transactions and statistics. Mollie is the quickest and easiest way to implement paysafecard. Przelewy24 supports 165 banks and several other payment methods, and is therefore the most popular payment method in Poland. With Mollie you pay these low rates only for successful transactions. Przelewy24 is the most popular payment method in Poland. Przelewy24 makes it possible for customers in Poland to pay online, via a number of Polish banks, international credit cards and various other payment methods, for example SMS. Bank transfer is the most popular way to pay online in Poland: 80-90% of online payments are made using some form of bank transfer. To enable this for as many customers as possible, Przelewy24 provides support for 165 Polish banks. In addition, Poland is a market with great potential for e-commerce. The number of people who have access to the internet is still growing. It is expected that 65% of the almost 38 million population will have access to the internet by 2019. Payments using Przelewy24 are guaranteed and confirmed immediately, this means the payment can’t be reversed by the consumer. In addition, payments are securely authenticated using Przelewy24 3D-secure. This makes this payment method particularly suitable for online shops. Bank transfer is the most popular way to pay online in Poland; 80-90% of online payments are made using some form of bank transfer. To facilitate this for as many customers as possible, Przelewy24 provides support for 165 Polish banks. Payments using Przelewy24 are guaranteed and confirmed immediately, so the payment cannot be reversed by the consumer. In addition, payments are securely authenticated using Przelewy24 3D-secure. This makes this payment method particularly suitable for online shops.